Ms. McMahon helps her students grow into people who ask questions, seek answers, right wrongs, struggle, make mistakes and persevere through academic and social interactions throughout the day. 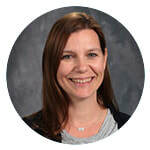 In her daily teaching, she especially loves the connections that are fostered through conferring with kids one-on-one about reading and writing. In those conferences, she can hear students' thoughts, stories, and personal connections to the classroom work and learn how to better guide, support, and inspire them. Ms. McMahon considers Burley a second home -- not just for herself, but also for her own two children, who are current students. Ms. McMahon comes from a family of musicians; she played cello in orchestra and performed at Carnegie Hall in high school. She enjoys yoga, reading, gardening, and travel. As a reader, her favorites are historical fiction, funny short stories, and news/current events.